Spring Has Arrived in Houston! hot and hotter! Sometimes we have an autumn, we usually have a little teaser of a springtime, we have a very short, mild winter and the rest of the year is hot and humid. In fact, in 2010, Houston (my part of town, anyway) had the harshest winter that I’ve ever seen and I have lived here all of my life. Even those who did their best to winterize their property had pipes burst around their homes…mine included. The precautions that we took just weren’t enough this time. We had sub-freezing temperatures, sometimes in the teens for 2 straight weeks. Plants died, grass turned brown, roads were icy, etc. I know, we were incredibly blessed that we had it better than many other parts of the country. I’m very thankful for that, to be sure. Then, when the freezing temperatures and rainy weather finally passed on through, finally, we all began to assess the situation, venturing outdoors to ascertain the condition of everything around us. Our friendly neighborhood handyman was kept very busy repairing and replacing busted pipes, cutting and hauling away broken tree branches and various other jobs to help us recover from the blistering winter that we had experienced. Little by little we began to notice that it wasn’t quite so cold anymore. It was warming up. 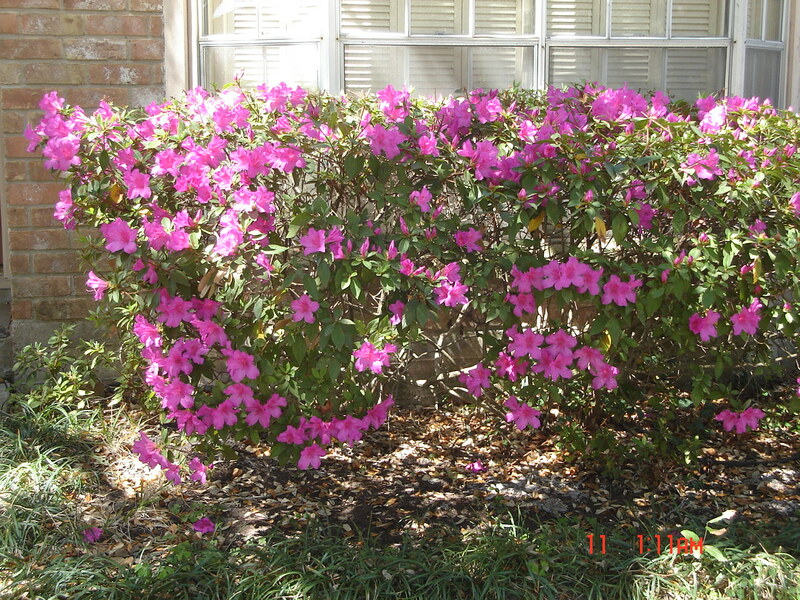 The azalea bushes were bursting forth in joyous celebration of spring, with those unmistakably gorgeous pink and crimson colored blooms dancing in the warm March breeze. Spring has arrived! All the plants and flowers are, in fact, starting to bud and bloom. 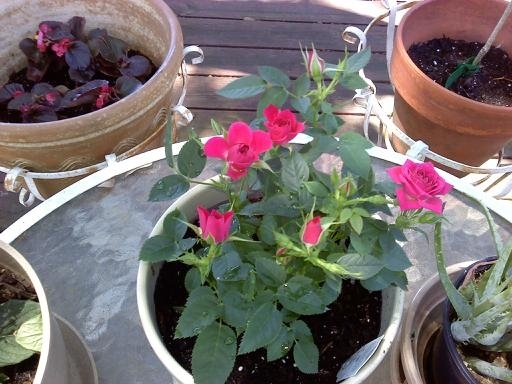 Neighbors are scurrying to Lowe’s to buy new plants and bags of soil to plant new gardens, as we bid farewell to the plants which said goodbye during the winter freeze. The old has passed, the new is coming forth. I was so disheartened at the loss of so many of Mom’s plants which had survived so many Houston winters, but just couldn’t handle this one. After I had grieved for a short while, I decided that this would be a good opportunity to start anew with my very own garden plants. 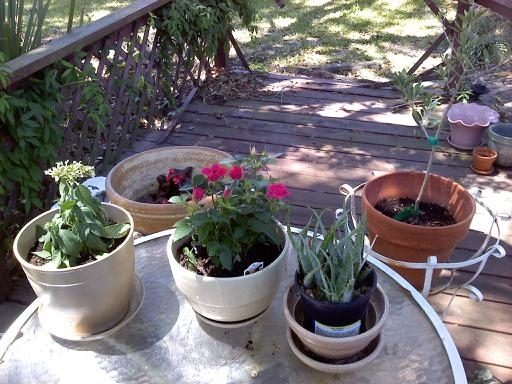 I now have five of my very own “babies” which I fondly call “Darla’s Garden”. It consists of a mini rose plant, a new pot of begonias, an aloe vera plant, an olive tree and a plant which attracts butterflies. I am posting pictures of them with this story. One of my goals is to have a landscape company come out and prune out my flower bed next to the driveway. I will then plant my buttlerfly plant, along with some other plants and flowers which are supposed to attract butterflies and ultimately have a butterfly garden. I hope to be able to stand at my kitchen window and watch the butterflies flourish along the driveway and enjoy themselves as they flutter by! Welcome, Springtime!! !